Please vote for us to continue our commitment and endeavours to eliminate soft plastics from landfill. 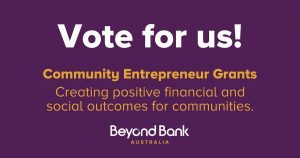 The Plastic Police® Program has made it to the next stage of the Beyond Bank Entrepreneurial Grants. What a journey its been since we first kicked off with the trial at my children’s local school.